The Britax Marathon G4.1 Convertible Car Seat is a car seat that can be used from infancy to 65 pounds. This car seat uses a SafeCell Impact Protection System, which includes a steel frame, energy-absorbing base, and patented V-shaped tether. There is also a side protection, created with a deep energy-absorbing shell, that shields your child in the unlikely event of a collision. The Quick-Adjust 10-Position and 2-Position Buckle allows you to have a secure fit even while your child grows. Along with this is a 3 Recline Position for your child, which provides comfort and safety. Easy-on/off Lower Anchors lock into place with a simple click, and are released quickly by pushing a button. 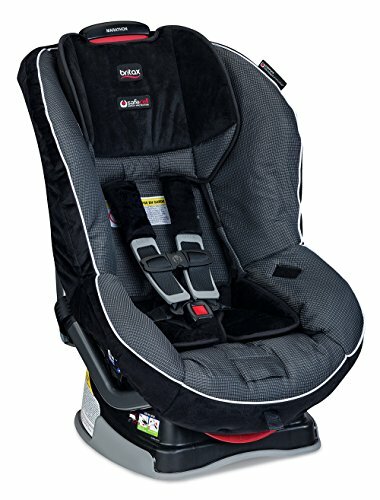 The Britax Marathon G4.1 Convertible Car Seat converts from a rear-facing position to a forward-facing position. The rear-facing position is for babies 5-40 lbs. and the forward-facing position is for children 20-65 lbs. As of this writing there were 460 reviews left by people who bought the Britax Marathon G4.1 Convertible Crib. I've read the reviews and condensed them into the hot topics for this car seat. I hope that this review helps you to select the best car seat for your little one. "This has great adjustment on the top for taller kids and the ability to adjust the angle is really nice for younger kids. This is a great safety seat for anyone looking for a car seat." The price of the Britax Marathon G4.1 Convertible Car Seat is on the high side. Yet, surprisingly, not many people complained about the price in the reviews. Some car seats can be a real pain to install. It's very important that your car seat is installed properly. If it is not put in correctly, it can be very hazardous for your child if he or she were to be in an accident. Most communities have check points to see if your car seat is installed correctly. You can call your local hospital or fire department to find out if your town has a place to have your car seat checked. With that being said, the Britax Marathon G4.1 Convertible Car Seat is easy to install according to parents who left reviews. "Between our car seats and all the car seats all the grandparents have, our Britax seats are by far the easiest to install and deal with, they also fit rear-facing in every car we've put them in." "The only thing I would say I don't like about this product, is when you buckle your child in, the leg straps are very tight and can't be adjusted. I know this is a known issue, but my child's legs get marks every time he rides in it." "I have bought two of these car seats over the last couple years. The first one was in a car accident while we were on vacation. My 18 month old son was rear facing in his car seat when we were hit and the car over turned. He came out 100% okay. No injuries, he was just a little shaken up. Very easy to install securely and adjust the shoulder straps height. Like the multi-reclining positions. It is a bit heavy for travel without some sort of cart, but worth the weight for the protection and comfort the car seat provides." After reading the reviews, one thing that stood out to me was that the customer service with this company was very good. Also, when there was a problem, the company was quick to fix it. This customer's comment reflected what many people were saying, "I had purchased the Onyx color and after 6 months the white trim around the seat began to fray and detach from the seat. I contacted Britax and without hesitation, they sent me a replacement cover free of charge with no inconvenience to me. They gave me the option of picking the same color or going with a different pattern. I opted for the Domino pattern and it's just as comfortable and doesn't have the trim around the seat. I received the replacement within days and love it! Outstanding customer service from a company who truly stands behind their products! Buy Britax, you will not be disappointed!!" "We bought this car seat mostly for travel purposes, as it's lighter weight than most other convertible car seats and isn't too difficult to transport in the airport (with the Brits rolling bag), put into the plane, and install in rental cars." Overall, parents who have bought the Britax Marathon G4.1 Convertible Car Seat were very satisfied with it. The only recurring complaint was that the leg straps were too snug. I hope that this review helps your family to determine if the Britax Marathon G4.1 Convertible Car Seat is right for you. To read the rest of our car seat reviews, check out our article here.